Get away to this lovely Anaheim hotel and delight in easy access to Disneyland� and the Anaheim Convention Center while enjoying homey and spacious lodging. Located just steps away from Disneyland� Park, Disney's California Adventure�, Downtown Disney� and House of Blues Anaheim, you'll be in the center of all the area's well-known attractions while staying at this Anaheim hotel. Delight in the variety of restaurants and entertainment options at the area's theme parks - and our affordable rates will ensure you'll be able to enjoy all the area has to offer without overpaying. The Grove, Knott's Berry Farm�, Fashion Island and Newport Beach are all within 15 miles of the Best Western Plus Anaheim Inn. Sports enthusiasts will delight in taking in an Angel's baseball game at Edison International Field or a Mighty Ducks hockey game at Honda Center - both are just three miles from the Best Western Plus Anaheim Inn. Travel just a bit further and you can enjoy visiting Huntington Beach, Aquarium of the Pacific, Universal Studios�, SeaWorld� and San Diego Zoo while staying at this hotel near Disneyland�. Have a culinary craving? There are seven restaurants within less than a mile of this Anaheim hotel. Those traveling on business for area conventions and events will delight in the fact that Anaheim Convention Center is just a couple blocks from this Anaheim hotel. Traveling is easy and stress-free - the John Wayne Airport is only 13 miles away. Guests can expect many wonderful amenities, including a refrigerator, a microwave, a coffee maker, cable satellite television with HBO� and free high-speed Internet access, in each spacious, clean room at this Anaheim hotel. You can also enjoy an outdoor heated pool and hot tub, a 24-hour front desk, sightseeing tours, free parking, dry cleaning and Disney� Park Hopper tickets for purchase during your stay at this Disneyland� hotel. Enjoy your stay. �From: All directions. 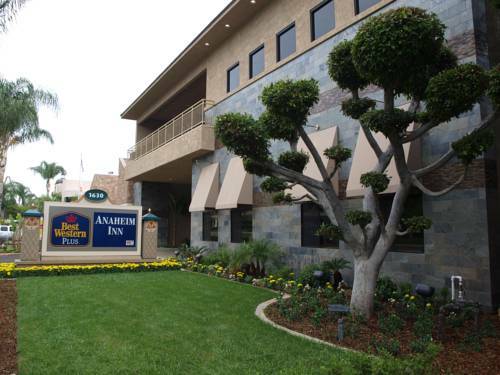 The Best Western Plus Anaheim Inn is one block south of Interstate 5 on Harbor Boulevard. Airport buses from both Los Angeles International and John Wayne Airports are available for a fee. 8.00 mile(s) from Main Place Shopping Mall, indoor shopping mall, department stores, etc.